Why not cook a delicious piece of local lamb this weekend. Easter is only a few days away, and traditionally roast lamb is served on Easter Sunday. This tradition goes back to a time before Easter, where a sacrificial lamb was roasted and eaten to celebrate the first Passover by the Jewish people. As Hebrews converted to Christianity, they brought their traditions with them. The Christians often reference Jesus as the Lamb of God, thus the traditions merged. I love roast lamb; local Mayo lamb is full of flavour, due to the fertile pastures of the county. 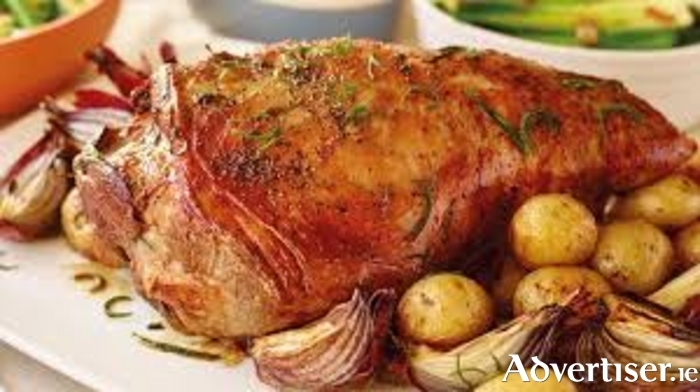 Today, I would like to share my roast lamb recipe with you, to try at home, at Easter or whenever. Preheat the oven to 200C. Put the onion, carrot, and celery onto an oven tray, top with the lamb. With a small knife, make incisions into the lamb and shove in the garlic, the butter, and the rosemary into each incision. Grind on the black pepper and sea salt, squeeze the lemon on top as well and coat with the rest of the butter. Some chefs use anchovies instead of the salt as they pair well with the lamb, but that is optional. Lastly, add a glass of water and the glass of wine into the tray and place into the oven for 20 minutes to roast. Turn down the oven to 170C and cook for another hour and a half, depending on how well done you like your meat. Baste the roast regularly with the winy juices to get more flavour in the flesh. Remove the lamb from the oven when it is cooked to the way you like it, and allow it to rest for at least 20 minutes before you carve it. While you are resting the meat, drain your winy meat juices into a saucepan and use this to make your gravy. When it comes to good food smells, this is one of the best, because when you slice the lamb the waft of lemon, garlic and rosemary hits you head on. This simple Easter roast lamb meal is best served with fluffy mashed potatoes and roasted vegetables. We always have the same dessert every Easter, Cadbury’s Easter egg straight from the fridge, delicious. If you fancy making your own chocolate dessert, this one is a no cook, no brainer, and ideal any time of the year. Line a small to medium sized square baking tray with baking paper. Place biscuits into a freezer bag and bash with a rolling pin or just the side of your fist until they're broken into a mixture of everything between dust and 50c size lumps. Put this to one side. In a large sauce pan melt the butter, chocolate, and golden syrup over a gentle heat stirring it constantly until there are no or almost no more lumps of chocolate visible, then remove from the heat. Take biscuits, marshmallows, and any additional ingredients and pour into the pan of the chocolate mixture. Stir all this into the mixture until everything is completely covered. Tip the mixture into the lined baking tray, making sure you get it all, and spread the mixture out to the corners. Refrigerate this for at least two hours then dust with icing sugar and cut into fingers of sizes you deem necessary. If you think that you can help me in my quest to promote food in the county, or if you would like a recipe printed or have any cooking questions, please contact me on my e-mail [email protected] and I will do my best to accommodate you. Wishing you all a peaceful Easter and talk to you next week!